Mitre saws have a bit of a reputation as the sort of kit usually reserved for site work alone. But as they have become more sophisticated over recent years and better suited to more general usage, they're appealing to a growing army of workshop machinists. Mounted on a benchtop the GCM 10 SD, like any other sliding mitre saw, takes up a fair amount of room. But for sheer versatility these kind of machines really do take some beating. You would be very hard pushed to find a comparable investment that matches the GCM 10's wide variety of functions. At your disposal you will have a means by which you can tackle a wide assortment of cuts ranging from the most basic to the seemingly impossible. 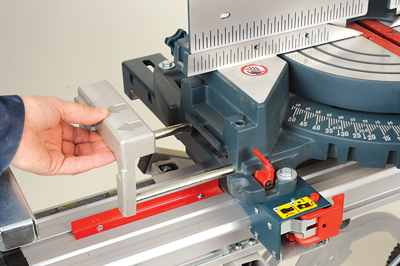 Mitre cuts up to 60° to the right and incline cuts up to 47° should cover most needs. Unlike its larger, more recent sibling, the GCM 12 GDL, this model doesn't have any unique features to rate it as a must-have, so what can you expect for your £500? Well, this is a hefty piece of kit for a start, that's what. Any sliding mitre saw with a crosscut capacity of 300mm is not exactly easy to manhandle into the back of the van, so, if portability is at the top of your list of priorities then perhaps the GCM is not for you. 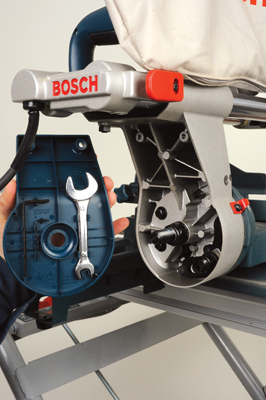 Bosch have gone to great lengths to counter any portability issues by creating a pair of carrying handles so that man and machine are better equipped for moving around in harmony. Even so, thereâ€™s no denying the GCM 10 SD is a bit of a bruiser. 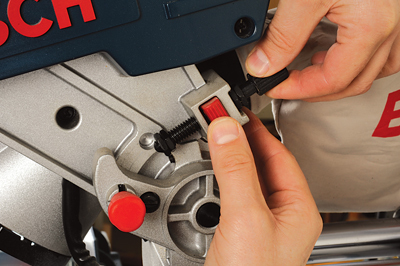 In its favour the GCM has all its controls at the front of the machine, so alternating between functions is a great deal easier than on many other mitre saws. Furthermore, the main grip can be rotated between four positions to find the one best suited to the application. Other features include a quick-set trenching facility, length stops left and right of the blade - 475mm max - and an electronic-braked motor. With all these features designed to make machining easier, safer and more efficient, it's hard not to find something to like. The cutting capacity is comparable with similar machines - 85mm deep at 90° over 305mm and reasonably accurate. 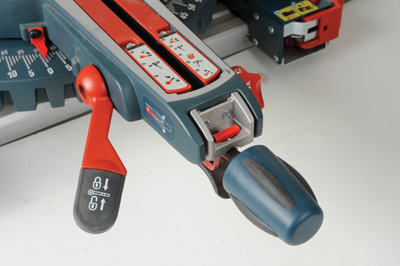 This is in no way a slur on the GCM 10's ability, merely typical behaviour for all sliding mitre saws. It's probably best not to expect true precision on this kind of machine. If it's reliable square cuts you are after, set it up and don't move it. Or, better still, get yourself a chop saw because each and every mechanism working at the limits of its spec is almost guaranteed to wander. The turn table is smaller than some comparable machines like the DeWalt XPS for example, which is about 60mm longer. You could argue that there the GCM 10 offers less support for larger workpieces, but in reality I'm not sure it makes a great deal of difference. As long as there is adequate support off the bed then it is highly unlikely that you will encounter any serious problems. 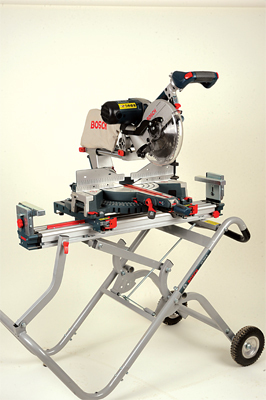 One way to eliminate any issues in this department is to dig a little deeper and purchase the GTA 2500 W saw stand. If you do intend to venture beyond the confines of the workshop, it'll be money well spent saving you a lot of effort to get the saw where you need it. Perhaps by today's standards the GCM 10 SD is showing its age a little, but make no mistake it's still got plenty going for it. The dial around the table to indicate mitre angles is rather crude suggesting that the settings are more ballpark than spot on. In contrast, the bevel angle readout at the back of the machine instils more confidence. On the whole this is a nice solid machine without gimmicks that you pay for and never see the benefit.